These are my posts from conferences, talks, and tours that I find interesting and want to share with others, as well as popular science writing. Kevin Anderson talk at Lund University, June 2015: "Delivering on 2°C: Evolution or Revolution?" Bill McKibben accepts 2014 "Alternative Nobel Prize" at Right Livelihood Awards Ceremony. His speech highlights the urgent need to "peacefully and firmly fight climate change in every corner of the world." People's Climate March in Lund and Copenhagen- my contribution to the #peopleofclimate social media project, September 2014. 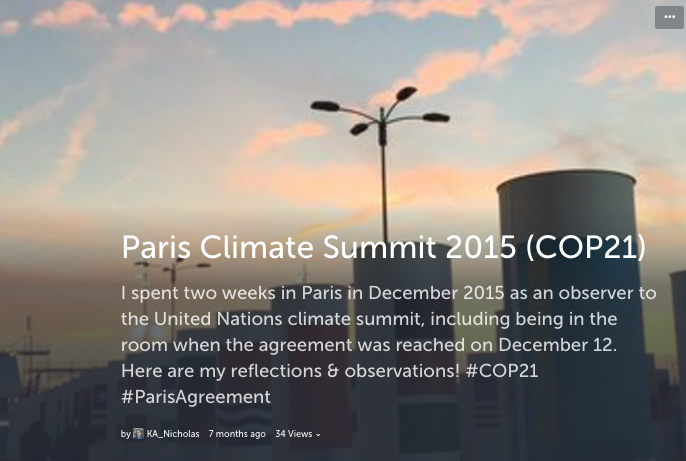 COP21- United Nations climate summit leading to the Paris Agreement, December 2015. Scientists press conference at COP21- five top scientists responding to the penultimate draft of the Paris Agreement. Transformations 2015- conference on transformations towards sustainability in the Anthropocene. Stockholm, October 2015. Our Common Future Under Climate Change- conference with over 2,000 scientists from 100 countries describing the state of knowledge on climate change and looking towards solutions. Paris, July 2015. EAT Stockholm Food Forum 2015- Livetweets from the 2nd @EATforum linking food, health, and sustainability, with speakers from research, policy, business, civil society. Themes: Global food outlook, redesigning food systems, new economic models, changing diets. Stockholm, June 2015. Swedish Secretariat for Environmental Earth Systems Science workshop explaining the Swedish role in the international global change research landscape at Lund University, May 2015. Lund University Sustainability Forum Kickoff- Introduction to the new initiative to connect sustainability researchers across Lund University and beyond with each other and society. Lund, February 2015. 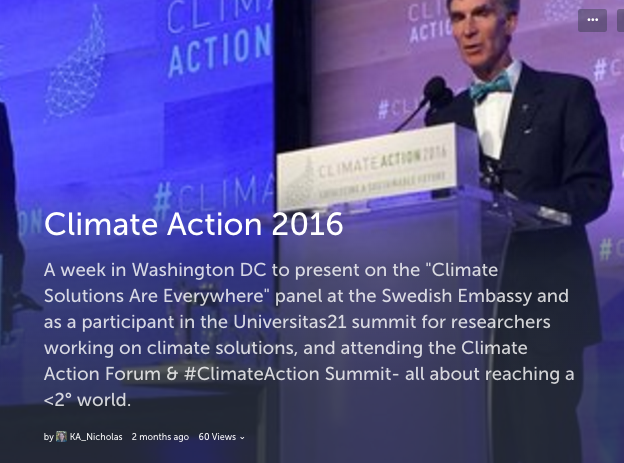 My week on @Realscientists- I was honored to curate the rotating Twitter account for a week in July 2015. Here's a compilation of my reflections on research, teaching, mentoring, motivation, collaboration, and snapshots of what it's like to be a scientist going between science and communications at the Our Common Future Under Climate Change conference. July 2015. Productivity and Time Management Seminar- Seminar sponsored by Lund University Postdoc Society (open to all) with good tips on workflow, efficiency, planning, and getting things done. Women IN Great Sciences (WINGS) Annual Conference 2014, Lund University- One-day conference for early-career women in research, focused on interdisciplinary research, and mentoring and sponsorship. Grant Proposal Writing Workshop- a Storify of my livetweets of tips from former Nature editor Dan Csontos of Elevate Scientific on writing scientific proposals, September 2014. Visit to MAX Lab Particle Accelerators at Lund University, May 2015.